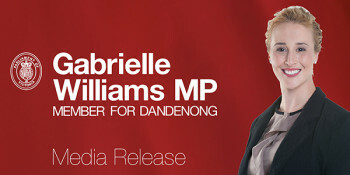 The Andrews Labor Government is stepping up its campaign to protect frontline healthcare workers in Dandenong from violence and abuse. Another business in Dandenong South is benefiting from an energy assessment grant it received as part of Victorian Government’s $6.1 million Boosting Business Productivity Program. New figures released today by the independent Crime Statistics Agency show the six-year crime trend that started in 2011 has been turned around, with people in Greater Dandenong experiencing a decline in crime rates for the past 12 months. Dandenong passengers will be able to enjoy reduced travel times to and from new destinations at Domain and Parkville, thanks to the $11 billion Metro Tunnel project. The Andrews Labor Government is delivering up to 80 extra services every week for passengers along the Dandenong Corridor, giving people more travel options across the day. The first rail bridge beam has been installed over Abbotts Road in a major milestone to remove another dangerous level crossing in Melbourne's south-east. Volunteer firefighters in Dandenong have received a $53,565.50 grant, thanks to a new Andrews Labor Government-funded program.